1. 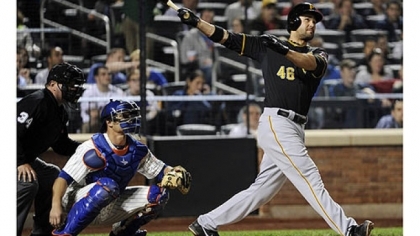 Garrett Jones-1B,OF-Pirates- This is Jones’ 5th year with Pittsburgh. He has hit 20 or more home runs in three of his four previous seasons with the Pirates. We get the fact that the southpaw’s pop is really against right handed pitchers for the most part and as such he only gets to pinch hit in games started by lefties. However, even with this handicap, he managed to belt 27 dingers just last season! If you can change your lineup on a daily basis and you are in need of power numbers, then perhaps you should consider the services of this multi-positional veteran who is still available in almost 65% of leagues. 3. Will Venable-OF-Padres- If you have a need for speed and can adjust you lineup daily, then Venable fits the bill! Venable has played his entire career will the Pods (5 seasons) and is someone that also will probably pinch hit or pinch run in games that are started by southpaws. Venable is a player to consider if 10 home runs and 25-30 stolen bases can help your roster because that’s exactly what you’ll get with him. Hardly owned (just 8%), Venable is there for the taking. 4. Scott Feldman-SP-Cubs- It’s still early yet, but at least so far it seems that the move from Texas to Chicago has does wonders for Feldman. He is sporting an ERA of 2.53 (almost half of his career average) and a WHIP of 1.15, while hitters are batting just under .200 against the 30 year old right hander. Feldman also has struck-out 33 in 42 innings. If he continues to pitch this well, he might not lose his starting job to Matt Garza (Lat) when he returns in several weeks. With the anemic Mets on tap for his next start, Feldman just might continue to impress. Streamers and deep-leaguers take note, Feldman is available in around 80% of leagues. 5. Oswaldo Arcia-OF-Twins- This young rookie has loads of potential for those in deeper roto leagues. Arcia can hit for average and has some pop to his bat- at least through his first 20 games in the major leagues. The right fielder who just turned 22 last week, has hit safely in 12 of his last 14 games; five of which were of the multi-hit variety. Arcia has three home runs in the bank and is batting .301 on the young season. Yes, he is a gamble, but again, with high reward for those who want to take a shot on the neophyte. While he is only owned in 10% of leagues, take out a flier on Arcia and watch how he performs over the coming week as the Twinkies take on the rival White Sox and then the red-hot Red Sox; both series in Minnesota. I like Arcia. I had him on my watch list prior to the year, but then Hicks had the monster spring and I kinda put him on the back burner. When he got the call though, it immediately came rushing back. In a 14-team 10-player keeper league, he could be a nice piece to have to trade for an extra draft pick after the year is done. Or keep him if Hosmer & Lawrie continue with their mediocrity. Ugh, lol. At least Machado broke out and gave me something to be excited about. I think having Arcia will pay dividends for you. We’re really high on the youngster. And as for Machado, he’s been on fire hasn’t he! 9 hits in his last 16 ABs and he’s got his average up to .331. He’s broken out of it in a big way!